The following is the last page, page 5, of an illustrated proof for the sudoku.com.au tough puzzle of 01/30/08. Page four made this into a relatively easy tough puzzle from this point forward. There are myriad manners to proceed. Many of these paths are not difficult. Below, I shall craft an end game that is minimal according to the way I rate proof or solution difficulty. 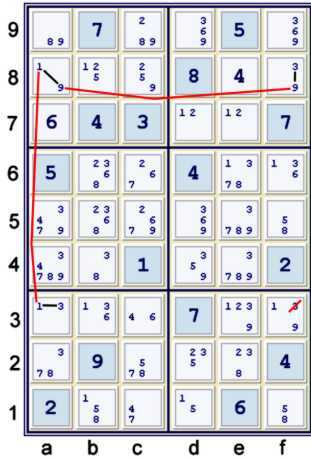 All of the sudoku strategies presented below have been treated with some significant detailing on previous blog pages. Some of these previous blog pages may be helpful. Links to these pages are found to the right, under Previous Entries. I may later list specific pages. Below, three steps are illustrated at once. Two of these are freshly available after cell i1 is solved. The locked 7's are available immediately after cell h2 is solved. Updating the puzzle mark-up helps to reveal this step, as (9)i1 => circling 4 at both cg1. I am ignoring lots of easy eliminations here, such as Locked 2s i23 => i568≠2. In my proofs, this is usually done in retrospect, as after I have solved the puzzle I can see that I do not need this step. Occasionally, I might see the way to the end of the puzzle and do not need the retrospective. The elimination of (4) from a3 helps make this elimination easy to find. It is usually a good idea to look at cells which have been updated by eliminations to see if anything new is available. Here I found a Y Wing, which is the reason for naming the group of all depth 3 elimination patterns Y Wing Styles. At this point, puzzle familiarity should help to make deductions like this one apparent. Moreover, one may start to get a feel for the importance of such a deduction towards unlocking the puzzle. Step 7d eliminated (3) from f3, giving the bivalue (1=9)f3. Of these eliminations, b3≠1 seems the most significant. It cascades the next two steps. Below, the elimination of (2) from b8 Locks candidate 2 into c89 within box 1. This combined with the previously noted restrictions and overlap of candidates 58 in this column make the following Hidden Triple easier for me to spot than the eventual naked triple 467 at c136 that performs much the same work. This makes this pattern almost hard to miss. Technique used: Combining chain snippets. Three chain snippets required. Technique used: Combining chain snippets. Two chain snippets required. 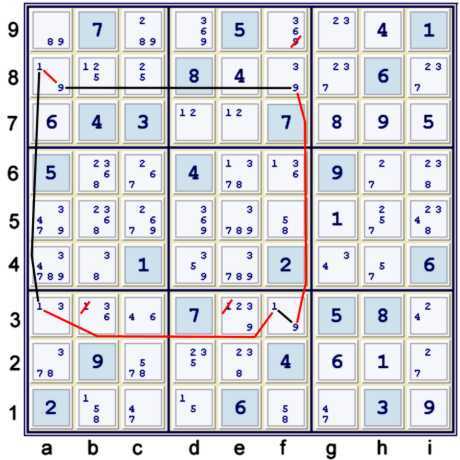 Creating and maintaining some manner of locating hidden sis in the puzzle. 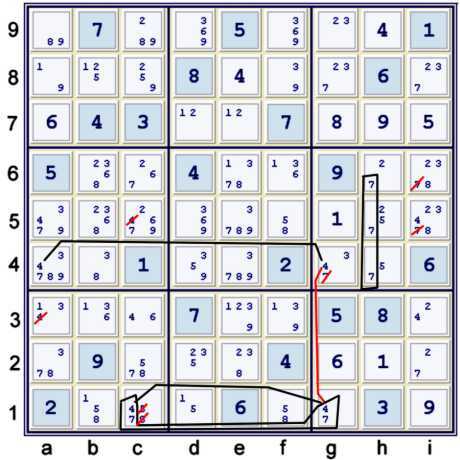 The puzzle mark-up shown is but one way to do so. Chain snippets are merely AICs. Often times, in combination, AAICs are used. Building upon previous proven information about the puzzle. It seems silly to limit the information retained about a particular puzzle to that information which is revealed by the Possibility Matrix. Specifically, remembering proven chain snippets and more importantly proven deduction sis. One may prefer to remember deduced weak links instead of proven sis. In my opinion, this preference is nothing but a matter of style. One may even prefer to remember some of each. Analyzing recent changes to puzzle information due to eliminations and deductions. This amounts to building a solution from the foundation already laid. In many respects, this process is well-suited to humans. After some practice, the relative signficance of many deductions becomes more apparent. I cannot quite describe how this knowledge of significance comes into existence. I believe the answer to be far too much practice. Being willing to combine disparite techniques without hesitation. By this, I mean that searches should often be non-technique specific. The puzzle, by its nature, determines which techniques will be fruitful. One has no foreknowledge of which ones that may be. Thus, it seems silly to have an approach that is so highly structured that it will miss things that may not be difficult, but may be novel. One example of this is the Almost Hidden pair Almost Naked triple overlap that I found for step 5b on Page four. Maximum depth: 11 at two different steps. This is high, especially since it occurs twice. That rating is about 5 times higher than each of the puzzles of 11/26/07 and 11/28/07. For comparison, one single step - the Hidden Pair Loop from the Easter Monster rates at over 655 - about 13 times higher for just one step in that puzzle!! This puzzle and The Easter Monster are not in the same league at all. 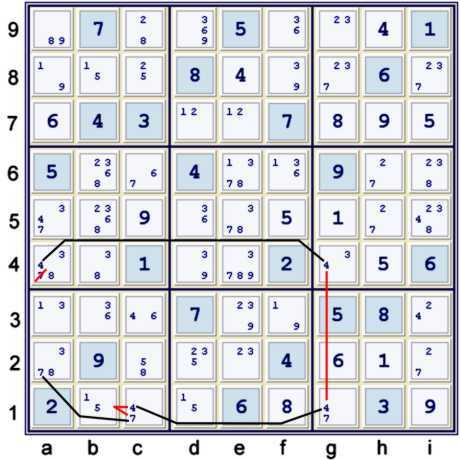 Finally, this puzzle rates about 100 times higher than the median tough at Sudoku.com.au. Thus, this puzzle is definately not standard fare. Attempting to finely detail how I found steps is not something that I wish to do often. It is time consuming and tedious. It has had a hidden bonus for me however. I believe I have gradually come to a better understanding of finding steps that I had once thought were merely accidental discoveries. I am quite certain now that the accidental discoveries are designed to occur by the manners of analyses.